What is a Named User Floating License? A Named User Floating License is a named user license that can be used to work with EnSuite-Lite on multiple computers on the same physical network. EnSuite-Lite has to be installed on all the computers. How does the Named User Floating License work? The Named User Floating License requires a login and password. The login and password is validated by a CCE Server, once confirmed the user can start utilizing the license. How many logins will be issued for each Named User Floating License? One login will be issued for each Named User Floating License purchased. Do we need to be connected to the internet even after login? Yes, in order to utilize the Named User Floating License make sure you're connected to the internet even after login. 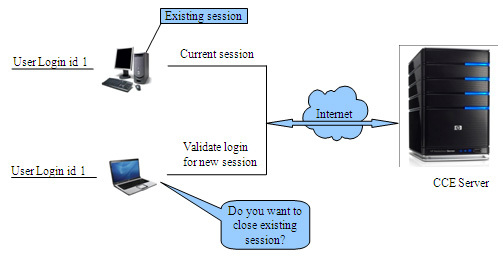 EnSuite-Lite application pings the server at regular intervals to ensure the session is active..
What happens if we lose the server connection after a successful login? Yes, in order to utilize the Named User Floating License make sure you're connected to the internet even after login. EnSuite-Lite application pings the server at regular intervals to ensure the session is active. What happens when the same user logs in from two different computers? How can we retrieve our Named User Floating License expiry information? After successful login, click Configure → Info to check the expiration date of your Floating License. How can we update user details or change passwords? After successful login, click Configure → Manage Users and click Edit in Users page, against your login ID to modify. What is the role of an Administrator in the Named User Floating License? Administrator can create, add and manage new/existing users. When you purchase more than one license, one of the logins can be designated as an administrator. For additional assistance or questions regarding issues with Named User Floating License, email : support@cadcam-e.com. When contacting the CCE support team about licensing issues, please provide a screen shot of the error message along with details of the issue.